Artist Karl Lohnes‘ limited edition portrait of Queen Elizabeth with the tagline – “It’s all Mine Now” – which is now being offered exclusively from one of my favorite retailers, CB2. Just in time to celebrate the Queen’s Jubilee year and to help me decorate what I hope to be a very hip apartment in Portsmouth, NH, I have fallen in love with this print. According to CB2, only 309 of these will be produced and it will not be reissued. I have placed my order, but it is no guarantee I will receive one – so I am keeping my fingers crossed and hoping that it will BE MINE soon. 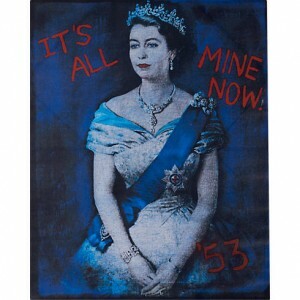 Find Karl Lohnes‘ ‘It’s all Mine Now” portrait of Queen Elizabeth at CB2 here. See all the great products of CB2 here. Did you ever get one of these? I have one, if you want to buy it. I love it, but it’s too large for my wall!! I have one and love it – thanks! If I hear of anyone who is looking for one I will pass your info along. Thanks for posting! I have one too. I have it in my living room. It’s amazing. I love mine and I am keeping it – but look on Ebay and other sites, I have seen them come up from time to time. Good luck! Crate & barrel outlet in Berkeley CA has one in stock as of today. No box. Adding my name to the “looking” list! Been trying to track this piece down for over a year! Figured I’d add my name in case anyone has one or comes across one. Thanks! I have also been searching for this for over a year!!! I would love to have an “it’s all mine” cb2 print. I’m interested. Please contact me at wallerstreet@yahoo.com Thanks! Also interested if available. Been looking for this print since it was in stores. If anyone ever has one for sale, please email me! I have been searching since our local CB2 store sold out years ago. Big fan of Karl Lohnes’ work. If you have an “It’s All Mine Now, ’53” print for sale, please contact me… dirck.rilla@comcasr.net. I’m very interested in purchasing if it is still available? I would be so grateful anyone out there who has this print for sale. I have been searching for a year. Thank you! I remain hopeful! I would love to purchase an “Its All Mine Now” print. I have been searching for ages, and if anyone is selling one please let me know! I too am desperately looking for this print. Maybe we should just all hammer CB2 to recreate this! Well seeing as we are all here putting out orders down, Ill tale one too….. I haven’t found any for sale on eBay or anywhere for at least 6 months. If anybody wants to let go of theirs, Ill take it. cj.512.nyc@gmail.com. I am in the NYC area. I would love to buy this for my daughter if anyone still has one for sale. I live in the Dubuque, Iowa area. colleengitter@gmail.com Thanks! I’m still looking for one of these portraits if anyone has one they would like to sell. I did get a response some months ago but have managed to lose that person’s email. What’s the going price for one of these now?? 6 long years of kicking myself for not buying this the day I saw it. Adding to the list of interested people! Lost Cowboy is powered by	WordPress 5.0.4 and delivered to you in 1.304 seconds using 48 queries.